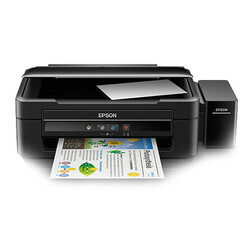 Wholesale Trader of a wide range of products which include hp gt5810 deskjet printer, epson l805 photo printer, epson l380 multi function inkjet printer, epson l360 printer and epson digital printer. Print thousands upon thousands of pages, all at an ultra-low cost-per-page. Our easy-access, spill-free refill system means no more mess, just exceptional quality and reliability for all your high-volume printing needs. An A4 6-colour photo printer with integrated ink tank, delivering ultra-low-cost photos with wireless connectivity: Photo printer with Wi-Fi, delivering low-cost and Epson-quality 6-colour photo printing with the convenience of an integrated ultra-high-capacity ink tank. Able to print from phones and tablets, the L805 allows photographers to easily connect and print their photos. Say goodbye to cartridges: An integrated ink tank system delivers cost-effective photo prints. The ultra-highcapacity ink tank, utilising 70ml ink bottles, can print up to 1,800 quality 10x15cm photos for an ultra-low cost per page1. Refilling using individual ink bottles is quick and easy thanks to fast ink top-up technology, clearly labelled bottles and drip-free nozzles. Easy to use and reliable: Primarily aimed at photographers, photolabs, advertising agencies, educational organisations and other users after an ultra-low cost per print solution for wireless photo printing, and printing onto CDs or DVDs. It's easy to increase productivity and reduce downtime with hassle-free set-up and reliable printing. 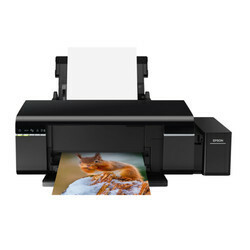 Print a 10 x 15cm photo in as little as 12 seconds2, while the genuine integrated ink tank system with one year or 3,000 pages manufacturer warranty provides peace of mind. Boost productivity: Wi-Fi connectivity and Epson Connect make printing from smartphones and tablets easy, while its compact, space-saving design makes it a great fit for most spaces. Expect quick-drying, smudge-free and consistent quality results from Epson's Micro Piezo technology and Epson genuine ink, which deliver prints with unrivalled durability, quality and reliability. Epson’s L380 InkTank Printer, with the benefit of 2 additional black ink bottles, allows you to print even higher volumes at the lowest cost. A higher warranty coverage, of up to 1 year or 30,000 pages^ ensures peace of mind when accomplishing high-volume jobs. Complete tasks quicker with print speeds of up to 10 ipm for black and 5.0 ipm for colour. Superb Print Speeds: Speed is key when it comes to meeting the challenges of deadlines and driving up your business performance. Powered by the Micro Piezo™ printhead technology, discover exceptional print speeds of up to 9.2ipm for default black and white prints, and 4.5ipm for default colour prints. High volume printing has never been this quick and efficient. Low Costs, High Yield: Don’t compromise on cost as you print. With Epson’s original ink tank system, you’ll be able to save costs as each bottle of ink costs only S$9.90 and each set has an ultra-high yield of 7,500 for colour or 4,500 pages for black. With a patented bottle tip design to allow easy and mess-free refills, tubes in the printer are also designed to be of optimum width to ensure smooth and reliable ink flow at all times. Epson Warranty for Peace of Mind: Enjoy Epson’s warranty coverage of up to two years or 30,000 prints, whichever comes first, for maximum value from your printer. Epson’s warranty includes coverage of printhead, which is most important for a printer designed for high volume printing. Astounding Print Quality: An astoundingly high resolution of 5760 dpi delivers exceptionally high quality prints for all your personal and creative needs. One-touch Scan and Copy: Conveniently perform scan and copy functions with a reliably precise sensor. Scans are sharp and clear while draft mode copies are completed in a matter of seconds. Space-saving Design: The L360 is designed for small spaces. Its compact footprint means you can fit it comfortably anywhere in your office or home, creating an ergonomic work environment. Quality that Shines. Value that Lasts: Epson genuine ink bottles are formulated to deliver outstanding high-volume print quality with L-series printers. Every bottle is individually sealed to ensure the purity of ink and comes with a smart tip designed for mess-free refills. Choose Epson genuine ink bottles to enjoy lasting quality with your L-series printer and low printing costs. delivering ultra-low-cost photos with wireless connectivity.